Guernsey – It's Time to Read! What an extraordinary book. The narrative is all letters. 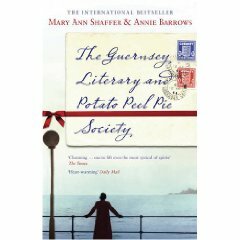 It is through a letter that Juliet, an author struggling to find something to write about after WW2 discovers about The Guernsey Literary and Potato Peel Society. She receives a letter from Dawsey about a book of hers he has, and from there their correspondence blossoms. Soon there are several members of the Society writing to her and she learns how the group came about and how they have helped each other through the Nazi Occupation of the Island. She is drawn to the place and eventually ends up living there; where she finds her writing mojo, forms lasting bonds and finds peace and love. I loved this book. Even though it is written in letters it is very easy to read. I liked that it was all written in letters, it gave a more personal feel as people were free to express their feelings to their friends. I found the story to be extraordinary – what a genius idea for keeping sane during a war. I just love the idea that books can bring people together and can form lasting bonds between people. I loved all the characters. It was a joy to watch Juliet find happiness, she was a lovely person to read about. And the Literary Society were a group of great people. Dawsey is a strong, solid, reliable man, and I fell in love with him. It is interesting that even though we never meet Elizabeth we hear all these wonderful stories bout her and her heroics, how she brought everyone together and helped them out in times of need, and I found myself wanting to get to know her. And when we discovered what happened to her I could have cried. I was attached to this book and the characters. It wasn’t a quick read, but lovely. Well worth reading. I felt emotions along with the characters and didn’t want the book to end. One of the best books I’ve read recently. This is a must read.